As I mentioned in my previous paper boat post, I've always loved the process of turning paper into something that floats ever since I read Curious George Rides a Bike. This time I followed the traditional pattern, but used them to make a garland for my dining room window. I used the excellent tutorial on Crescendoh's blog here. She has the same vintage atlas I do! It has maps, astronomical illustrations, data charts, and sociological information in addition to world maps so there are a variety of page styles to choose from in one book. You can buy one for $2-15 plus shipping online, or diligently check every thrift store you visit for a year like I did. 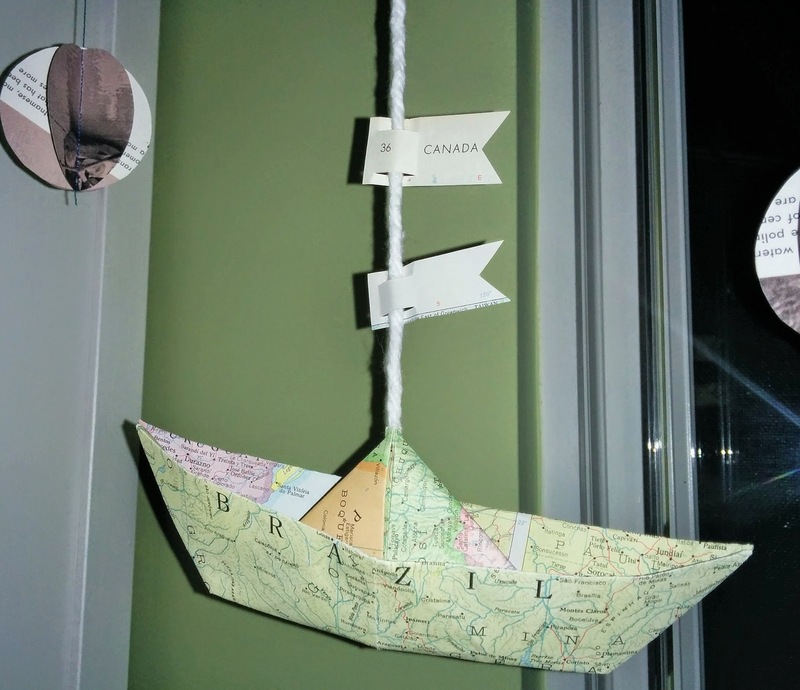 The boats were too plain alone, so I added paper spheres in two sizes, and cut little flags to thread onto the cotton rope, all using paper from the same atlas. I machine sewed three circles together to make each sphere. If you don't sew you can cut out twice as many, fold each in half and glue them together, then thread a cord through the middle, but that sounds like it will take forever, so even though I don't sew much these days, I whipped out 10 spheres in about 45 minutes from start to finish. I was very tempted to buy a paper punch from JoAnn's to make it go faster, but storage is limited in my little house. If you're not so constricted, you can see one here. 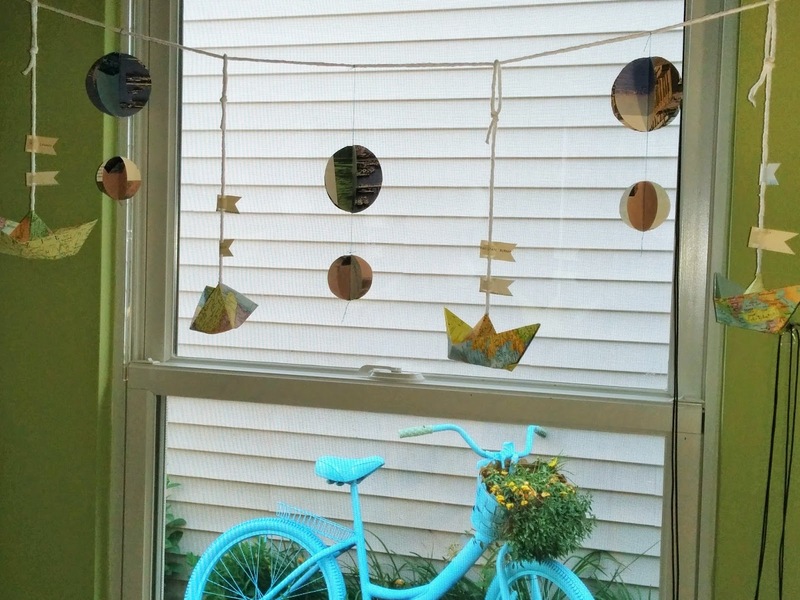 There is a pretty good sewn garland tutorial on Art and Whimsies' blog here. I will warn you that many sewing machines can't make "empty stitches" as she calls them (stitches without paper or fabric) without breaking the thread. If that's the case with your machine, just lift the presser foot, pull your thread gently to give a few inches between each sphere, then lower the presser foot and sew the next sphere. When your garland is finished, gently twist it a lot of times so the threads will twist together attractively in each section. Also, you will probably want to adjust your stitch length to 3 or 4 (twice the normal 2mm length). Paper is slipperier than most fabrics and if you stitch too close together the halves will tear apart when you fan them out. Side note-use decorative machine stitches without any thread to make cool perforated patterns on plain papers and cardstock. I was thinking of adding a second and third tier of bunting cut from more atlas pages, but sometimes I go too far and the effect is lost. So I stopped here and will wait a week before adding anything else.